Objective This study examined the impact of a multicomponent intervention to increase physical activity (PA) in adults with type 2 diabetes (T2D) in Oman. Research design and methods This is a cluster randomized controlled trial in eight primary health centers. Participants were physically inactive, aged ≥18 years, and with no contraindication to PA. Patients attending intervention health centers (n=4) received the ‘MOVEdiabetes’ intervention, which consisted of personalized, individual face-to-face consultations by dietitians. Pedometers and monthly telephone WhatsApp messages were also used. Patients attending comparison health centers received usual care. The primary outcome was change in PA [Metabolic Equivalent(MET).min/week] after 12 months assessed by the Global Physical Activity Questionnaire. The secondary outcomes were changes in daily step counts, sitting time, weight, body mass index, glycated hemoglobin, blood pressure and lipids. Results Of the 232 participants (59.1% female, mean (SD) age 44.2 (8.1) years), 75% completed the study. At 12 months, the mean change in MET.min/week was +631.3 (95% CI 369.4 to 893.2) in the intervention group (IG) vs +183.2 (95% CI 83.3 to 283.0) in the comparison group, with a significant between-group difference of +447.4 (95% CI 150.7 to 744.1). The odds of meeting PA recommendations were 1.9 times higher in the IG (95% CI 1.2 to 3.3). Significant between-group differences in favor of IG were detected for mean steps/day (+757, 95% CI 18 to 1531) and sitting time hours/ per day (−1.5, 95% CI −2.4 to −0.7). Clinical measures of systolic and diastolic blood pressure and triglycerides also showed significant intervention effects. Conclusions ‘MOVEdiabetes’ was effective in increasing PA, the likelihood of meeting PA recommendations, and providing cardioprotective benefits in adults with T2D attending primary care. The relationship between physical activity (PA) and type 2 diabetes (T2D) has been widely researched. Minimal progress has been made in the implementation of research findings within everyday diabetes care practice. The current 1-year intervention was delivered in a real setting and using existing healthcare staff. This paper shows that the ‘MOVEdiabetes’ intervention was effective in increasing the PA levels in inactive adults with T2D. Secondary outcomes showed positive changes in blood pressure and triglycerides. Personalized PA consultations can be delivered within routine diabetes primary care. The role of the existing staff in diabetes primary care, namely dietitians, could be extended to deliver PA promotional methods, including PA consultations, use of pedometers and ‘WhatsApp’ monthly messages. Similar to global trends, diabetes prevalence in Oman is increasing. Recent estimates in Omani adults are in the order of 12.6%, which is exceeding global rates.1 This increase is predominantly in type 2 diabetes (T2D), which is preventable through lifestyle modifications.2 While diet and body weight are already part of routine diabetes management, physical activity (PA) advice and guidance is not routinely provided. 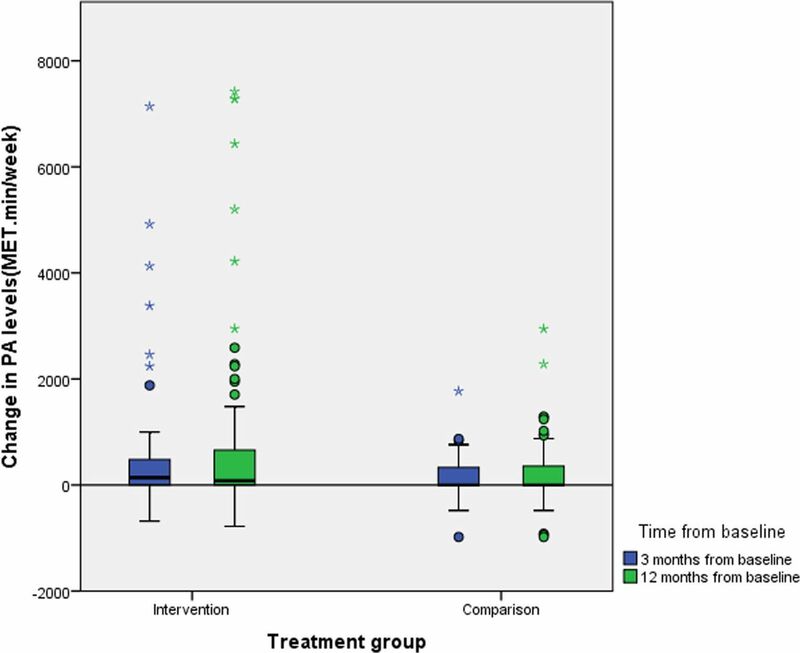 Current evidence on PA interventions in diabetes primary care comes mostly from Western countries, with mixed results.4 PA interventions have differed in their setting (clinical vs community), intervention methods (PA consultations, exercise sessions, or use of technology) and duration (short of 3–6 months vs long ≥12 months).4 Incorporating behavior change techniques (BCTs) in PA interventions has been shown to help individuals move from ‘inactive’ to ‘active’ stages of change for PA.12 While there are a large number of BCTs, these have been standardized by Abraham and Michie13 to assist the development of lifestyle interventions, and more recent updates describe an extensive range of opportunities to assist the design of context-specific programs.13–15 However, further research is needed to establish how far the BCTs can lead to more efficient designs for improving the PA behaviors in the context of diabetes care.14 Avery et al 12 (2012–2015) distinguished five context-appropriate BCTs for use during time-constrained consultations in diabetes care. These include ‘prompt focus on past success’, ‘barrier identification’, ‘use of follow-up prompts’, ‘providing information on where and when to perform the behaviour’ and ‘prompt review of behavioural goals of PA’.12 Further research is needed to investigate the BCTs that could be effective in promoting PA in Arabic-speaking countries. Evidence on the effectiveness of personalized PA consultations in clinical settings along with other supportive methods (eg, use of pedometers and telephones)15–17 has been reported in many studies in the West, including guidelines on how to deliver them.18–21 To address the sociodemographic, cultural and clinical diversities, the impact of such approaches on PA promotion in local routine diabetes primary care setting in the Middle East is yet to be explored. The aim of this paper is to describe the effectiveness of the multicomponent ‘MOVEdiabetes’ intervention on change in PA levels (primary outcome), and changes in objectively measured steps/day, sitting time (hours/ per day), weight, body mass index (BMI), glycated hemoglobin (HbA1c), blood pressure and lipids (secondary outcomes). Age, gender, marital status, education, and income were collected from the electronic health information system (HIS), and if data were missing they would be asked for it. Weight, BMI (kg/m2), systolic and diastolic blood pressure (mm Hg), HbA1c (%), and lipid profile (mmol/L) (total cholesterol, high-density lipoprotein (HDL), low-density lipoprotein (LDL), triglycerides (TGs)) were collected from the HIS in the health center. Self-perceived PA (MET.min/week) was estimated via face-to-face interviews using the Global Physical Activity Questionnaire (GPAQ).29 GPAQ is a 13-item PA questionnaire where levels of PA (MET.min/week) are estimated across work, travel and leisure domains.8 Moreover, objective assessment of PA (steps/day) and sitting time (hours/day) was carried out in a subset of selected subjects (40%). Initially all participants were offered accelerometers (activPAL micro, an ~20 g professional PA monitor)30 until the required numbers were reached. Application and removal of the accelerometers were performed in the health centers by the POs. The devices were programmed to continuously work for 7 days. They were wrapped in a plastic sleeve and then attached directly to the skin of the midline of the anterior aspect of the participant’s right thigh using an adhesive pad and tube bandages to keep the activity monitor in place.31 Participants were asked to adhere to wearing the device for 24 hours for 7 days and record their sleeping/waking time and removal of the device in a daily log given to them. Participants were strongly advised not to remove the device unless for swimming activities or if they experienced an allergic reactions, but to contact the POs in their respected health center if such an instance arose. Except for the sociodemographic data at baseline, all measures were collected by specialist diabetes nurses who were blinded to the study objectives and group allocation. Owing to the nature of this study, the POs could not be blinded to study objectives; however, they were not involved in data entry and/or analysis. All patients are advised on diet and weight management as part of routine care, but there are no requirements to focus on PA. The ‘MOVEdiabetes’ intervention was undertaken as personalized face-to-face consultations (maximum 20 min) by trained dietitians on three occasions (weeks 0, 4 and 8).26 The consultations aimed to encourage participants to achieve 150 min of moderate-intensity or 75 min of vigorous-intensity PA (or a combination of the two) per week (≥600 MET.min/week) at 12 months.26 The consultations were based on multiple BCTs reported in the ‘MOVEdiabetes’ study protocol.26 34 The content of the consultations is described in figure 1. Content of the face-to-face personalized physical activity (PA) consultations. It is estimated that a step count of no less than 6000–7000 per day is required to achieve this goal.35 Hence, all participants were given pedometers (Yamax Digi-Walker SW-200, Yamasa Tokei Keiki, Tokyo, Japan) to record their daily step counts for self-motivation and monitoring. Feedback on step counts was given within the PA consultation visits and/or discussed over the WhatsApp telephone application. Notably, all participants receiving the intervention activated their telephone WhatsApp application and received monthly messages from the POs in their respected health center.36 The messages were standardized to coincide with the international occasions/celebrations. These were hoped to motivate the participant to perform more PA (table 1). The messages were initially put in English and then translated to Arabic language to be sent to the participants. The content was reviewed and approved by the central and regional research ethical committees within the ‘MOVEdiabetes’ study protocol. POs initiated the WhatsApp groups, facilitated the conversations and monitored the group dynamics. Participants allocated to the CG received no further study relevant contacts after 3 months measures until the end of the study where they had their final measurments recorded at 12 months follow-up. The quality of the entered data was cross-checked by staff trained in quality assurance using checklists specific to the study in a sample of 10% of questionnaires selected at random. Data were entered into Epi Info V.7,37 checked and cleaned prior to analysis. Entered data were transferred to IBM SPSS Statistics V.22.0 for Windows for analysis according to the GPAQ protocol.8 An intention-to-treat analysis was performed according to the last value carried forward imputation for missing data at 3 and/or 12 months, and a mean imputation procedure was done where baseline data were missing. Descriptive statistics were expressed as proportions, mean (SD), and median (IQR) at the study group level. Due to skewness of data obtained, a univariate analysis was done in two steps. Initially, for each outcome, differences at 3 and 12 months from baseline were calculated, and Mann-Whitney U tests used to estimate between-group differences (intervention vs comparison) and the Wilcoxon signed-rank test to estimate within-group differences. Then, a time trend for treatment effect was estimated from a generalized linear model (GLM). Furthermore, the primary outcome was dichotomized to meeting the WHO PA recommendations, if MET.min/week values were ≥600, and not meeting the recommendations for <600 MET.min/week. GLM was used to determine the between-group difference in meeting the PA recommendations at 3 and 12 months independently. Moreover, within the IG, a multivariate analysis was carried out to identify potential correlates for changes in PA at 12 months across the studied sociodemographic characteristics. Accelerometer data of valid days, defined as 24 hours of wear per day with an allowance of no more than 4-hour removal time per day over the 7-day wear, with the monitor positioned in a dynamic axis orientation, were analyzed using a customized activPAL3 software.38 Prior to analysis, daily hours of sleep were estimated from the participants’ daily logs and eliminated from the outputs. The total number of steps per day and sitting time were then extracted from the accelerometer outputs, and between-group differences were explored. No patients were involved in setting the research question or the outcome measures, nor were they involved in developing plans for design or implementation of the study. No patients were asked to advise on interpretation or writing up of results. However, plans to disseminate the results of the research to study participants and relevant patient community will be considered. Of the 441 participants who were screened for inactivity, 232 (53%) consented to participate in the study. In total 174 (75%) completed the study measurements at baseline and at 3-month and 12-month follow-up (110 IG vs 105 CG, and 82 IG vs 92 CG, respectively). Figure 1 presents the Consolidated Standards of Reporting Trials (CONSORT) flow chart that describes the progress of participants throughout the 12-month follow-up study. Overall, out of 232 participants who provided consent, 227 (97.8%) completed the baseline measurements, 215 (92.7%) completed the 3-month follow-up measurements and 174 (75%) completed the final 12-month measurements. The reasons for attrition (IG n=40, CG n=18) are presented in the CONSORT diagram (figure 2), and the most frequently reported reasons were feeling uncomfortable with the accelerometers (41%), joint pain (14%), travel outside of Oman (12%), or being lost to follow-up without a reason being given (17%). Consolidated Standards of Reporting Trials flow chart describing progress of participants through the 12-month follow-up study. At baseline, more than half of the participants in both the intervention and comparison groups were women (64.5% and 54.1%, respectively), and the mean age (SD) of the total population was 44.2 (8.1) with a range of 22–68 years. The majority of the population (79.3%) were married, and half (50.9%) had completed their secondary education. Income was reported by 87.5% of the total population, of which more than half reported a moderate income of ≤1000 Omani rials/month. Additionally, more than half of the total population were employed, with a higher percentage in the intervention than in the comparison group (65.6% vs 50%, respectively). The two groups were similar in social status except for marital status (more married individuals in the CG vs IG) (p=0.03) and employment status (more employed individuals in the IG vs CG) (p=0.02) (table 2). The mean (SD) duration of diabetes for the total population was 5.8 (3.7) years, and 77.2% of them reported comorbidities, mainly hypertension (45.3%) or hyperlipidemia (35.6%) or both (15%), for which all were on antihypertensives or statins (lipid-reducing drugs) or both accordingly. Most (81%) of the sample (84.5% IG vs 77.3% CG) were on oral hypoglycemic drugs, of which 13.8% also used insulin (9.8% IG vs 18.2% CG; p=0.07) (table 2). At baseline, the mean (SD) BMI was >30 (8.3) kg/m2 in both groups. The mean systolic blood pressure (SBP) levels were within the target levels of <140 mm Hg in both groups. The mean (SD) diastolic blood pressure (DBP) was significantly higher in the IG (83.2 (9.4) mm Hg) than in the CG (78.7 (14.4) mm Hg) (p=0.003). The mean (SD) HbA1c in both groups was >7.0% (8.1 (1.7)% IG vs 7.8 (1.7)% CG), indicating poor diabetes control according to the Omani diabetes management guidelines.39 The average levels of total cholesterol and LDL, in both groups, were higher than the target limits. However, HDL and TG levels were all within target limits. There were no significant between-group differences in BMI, SBP, HbA1c, and lipid profile at baseline (table 3). Overall, about two-thirds (68.9%) of the calculated PA level (MET.min/week) was attributed to leisure activity, followed by 28.6% by travel and 2.5% by work. The dominance of leisure activity as the main contributor to the overall PA levels was prominent in both groups at all measurement points. At baseline there was no difference in median PA levels between the groups (p=0.08). However, at 3-month and 12-month follow-up, the median (IQR) change in PA from baseline was significantly greater in the IG than in the CG at both time-points: +17% at 3 months (+140 (0–480) vs 0 (0–330) MET.min/week, respectively; p=0.04) and +26% at 12 months (+80 (0–663) vs 0 (−7.5–361) MET.min/week, respectively; p=0.01) (figure 3). Change in physical activity (PA) levels from baseline at 3 and 12 months by treatment group. MET, Metabolic Equivalent. Additionally, figure 4 illustrates the steady increase in PA levels in both treatment groups, but in particular the significantly higher mean gain from baseline in the IG than in the CG at 12 months (+447.4 (95% CI 150.7 to 744.1) MET.min/week, p=0.003) (table 2). Mean (SE) change in mean physical activity levels (MET.min/week) in the treatment groups over 12 months. MET, Metabolic Equivalent.. Within the IG, the gain in PA levels at 12 months was significantly associated with high education (+500 MET.min/week, p=0.04, 95% CI 33.0 to 1144.4) and high income (+600 MET.min/week, p=0.02, 95% CI 127.7 to 1278.6). Despite no significant differences at baseline, the odds of meeting the WHO PA recommendations were significantly higher, by 1.8 (p=0.04, 95% CI 1.1 to 3.1) and 1.9 (p=0.02, 95% CI 1.2 to 3.3) times, in the IG compared with the CG at 3 and 12 months, respectively (table 4). Around half (48%) (n=59) of the participants in the IG vs 40% (n=44) in the CG used accelerometers at baseline. Overall, 69 participants (67%) had completed accelerometer use at both baseline and 12 months (33 in the IG vs 36 from the CG). The average (SD) number of valid days (minimum of 4 valid days) at baseline and at 3 and 12 months was 5.7 (1.0) (n=45), 5.3 (1.2) (n=38) and 5.3 (1.3) (n=28) in the IG, and 5.9 (1.0) (n=39), 5.4 (0.93) (n=32) and 5.9 (1.1) (n=30) in the CG, respectively. The average number of steps/day initially increased in the IG only at 3 months, thereafter increasing in both groups, such that the overall increase from baseline at 12 months was significantly greater in the IG than in the CG (table 4). Overall at 12 months the average steps/day was +757 steps/day higher in the intervention compared with the comparison group (p=0.05, 95% CI −18 to −1531) (table 3). Sitting time (hours/day) was found to change from 13.1 (2.4) to 12.2 (1.9) at 3 months to 12.2 (2.2) at 12 months within the IG versus a change from 13.7 (1.0) at baseline to 13.6 (1.2) at 3 months to 13.7 (1.4) at 12 months within the CG. Moreover, there was a significantly greater reduction in sitting time (hours/day) in the IG versus CG at both 3 and 12 months, by −1.3 (95% CI −2.2 to −0.6) and −1.5 (95% CI −2.4 to −0.7) hours per day, respectively (table 3). Table 3 illustrates the lack of any between-group differences in changes in weight, BMI or HbA1c. However, there were significantly greater reductions in the IG compared with CG in SBP by −3.8 (95% CI −6.7 to −0.9) mm Hg (p=0.008) at 3 months and −1.8 (95% CI −2.6 to −0.7) mm Hg (p=0.04) at 12 months, and in DBP by −1.6 (95% CI −2.6 to −0.7) mm Hg (p=0.001) at 12 months. Additionally, a significantly greater reduction in TG levels of −0.3 (95% CI −0.5 to −0.08) mmol/L (p=0.006) was observed in the IG versus CG. Nonetheless, despite no between-group differences in change in weight, BMI and HbA1c, significant within-group differences for median weight (p=≤0.001), BMI (p=≤0.001) and HbA1c (p=0.03) were found in the IG between baseline and 12 months. Except for discomfort from accelerometer use, no adverse events reported by participants were considered to be related to participation in the trial in neither the IG nor the CG. 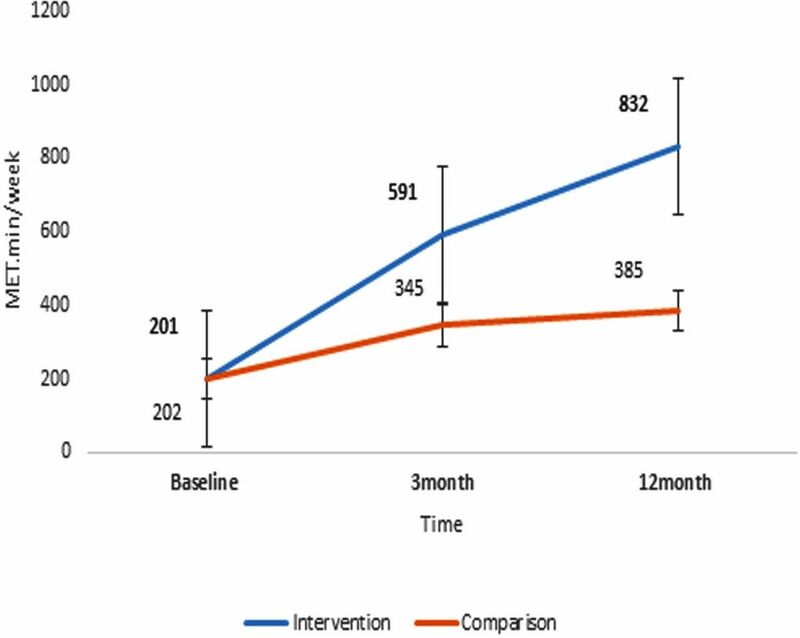 The current study showed that the multicomponent ‘MOVEdiabetes’ intervention, delivered by trained dietitians, was effective in increasing PA levels in physically inactive adults with T2D within a local diabetes primary care setting at 12 months. The objective accelerometer data also indicated a favorable increase in average number of steps/day in the IG. Similarly, objectively measured sitting time was reduced in the IG by −1.5 hours/day more than in the CG. Importantly, despite no significant changes in the metabolic outcomes (weight, BMI and HbA1c), the intervention showed favorable cardiovascular long-term outcomes,2 namely in reducing systolic and diastolic blood pressure and TGs at 12 months. Strengths of the current study demonstrate the ability of existing health professionals, namely dietitians, to extend their roles and deliver the intervention in a relevant clinical setting. Moreover, the use of physiological data from patients’ routine electronic medical records enabled the reporting of clinically relevant data. This is the first trial to use accelerometers within the local clinical diabetes setting in Oman. Despite the complexity of data from the accelerometers pertaining to dropout and non-compliance to the 24-hour wear protocol, changes in average steps/day and sitting time were in favor of the IG at 12 months. This finding supports the positive effects of the ‘MOVEdiabetes’ intervention on PA levels in the IG versus CG obtained from the self-reported questionnaire. It should be noted that the trial sample size was calculated on the basis of detecting changes in the self-reported PA questionnaire, not the accelerometers’ data. Moreover, despite the fact that the aim of the trial was not to validate the tools, limitations of the self-reported PA data including the possibility of false reporting cannot be excluded.40 Hence, further exploration may be required to validate the subjective PA measurement tools (GPAQ), investigate reasons for non-adherence and identify ways to improve compliance to accelerometer use. The intervention used in this trial included support provided via WhatsApp messages. To our knowledge, this is the first study to integrate such technology-based approach as a long-term support tool within a PA intervention study in Oman. It is possible that this approach could escalate trust between participants and POs in their respected health centers that facilitated sharing of information, and seeking support and feedback when needed.43 However, a study in Spain reported minor effects from WhatsApp-based interventions to promote PA training compared with face-to-face interventions.44 These results could be affected by cultural differences or the short study duration (10 weeks) and/or small sample size (n=32) in the latter study. Therefore, further research is needed on the use of WhatsApp and/or any other texting applications in promoting PA in clinical settings (alone and as part of an intervention design). The results from this study indicate a relatively small effect size; however, short-term and long-term odds of meeting the PA recommendation of ≥600 MET.min/week were significantly higher in the intervention versus comparison group (table 4), indicating potential clinical benefits of the ‘MOVEdiabetes’ intervention on general health. Other benefits related to body composition were not explored in this study; however, the results showed positive effects of the ‘MOVEdiabetes’ intervention on lowering blood pressure and TG levels, indicating possible cardioprotective benefits. The lack of a significant impact on the secondary outcomes, namely weight, BMI and HbA1c, is not unexpected given the intervention focused on PA alone (because usual care already provided advice on diet or weight management). More importantly, this result may be attributed to limited power to detect an intervention effect. Future adequately powered studies are required to better understand the impact of this intervention on secondary outcomes, including the biomedical, metabolic and cardiovascular markers. Given the rising trends of diabetes and physical inactivity in Oman, this study provides a potential and pragmatic platform for recommendations for greater integration of PA in the management of diabetes. The multidisciplinary approach applied in this intervention provided potential solutions for perceived barriers by health professionals on promoting PA, namely lack of time and frequent staff turnover.24 Although dietitians were responsible for delivering the PA consultations, diabetes doctors and nurses were all involved to reinforce the same PA messages to the participants. Moreover, with respect to the PA consultation guidelines reported in the literature,19 50 51 the guidelines on the personalized ‘MOVEdiabetes’ PA consultations within the current study could be further developed for consideration in future similar interventions in the Arab world. Equally important, similar to an online training program for healthcare professionals on PA,52–54 the PA training linked to this study for the healthcare professionals could be adapted at regional and central health administrative levels to be used in future PA training activities. A process analysis to assess the feasibility, appropriateness and suitability of roll-out of this intervention is yet to be undertaken. Further studies are required to ensure that the increase in PA levels is sustainable. Moreover, although this trial was integrated within routine care, future cost analysis may be required to highlight any additional cost–benefit. The ‘MOVEdiabetes’ intervention (face-to-face PA consultation delivered by a trained dietitian, with use of pedometers and WhatsApp telephone application for self-monitoring and support) was effective in increasing short-term and long-term PA, reducing sitting time and increasing the likelihood of meeting the WHO PA recommendations in adults with T2D attending their routine diabetes primary care clinics over 12 months. Additionally, despite no significant impact on weight, BMI and HbA1c, the intervention showed potentially protective cardiovascular effectiveness, namely in reducing blood pressure and TG levels. We would like to thank the TRC, Ahmed Al-Qasmi, Director General of Directorate of Planning, and Fatma Al-Ajmi, Director General of Health Services, Muscat in Oman Ministry of Health, for their support and constant supervision. Additionally, special thanks to Adil Al-Wahaibi for his assistance with the study statistics. Finally, many thanks to all POs who participated in the conduct of this study and who showed extraordinary levels of commitment and responsibility over the 12-month study period.
. IDF diabetes atlas. 6th edn. Belgium: International diabetes Federation, 201. American college of sports medicine. Exercise and type 2 diabete 2000:1345–60.
. 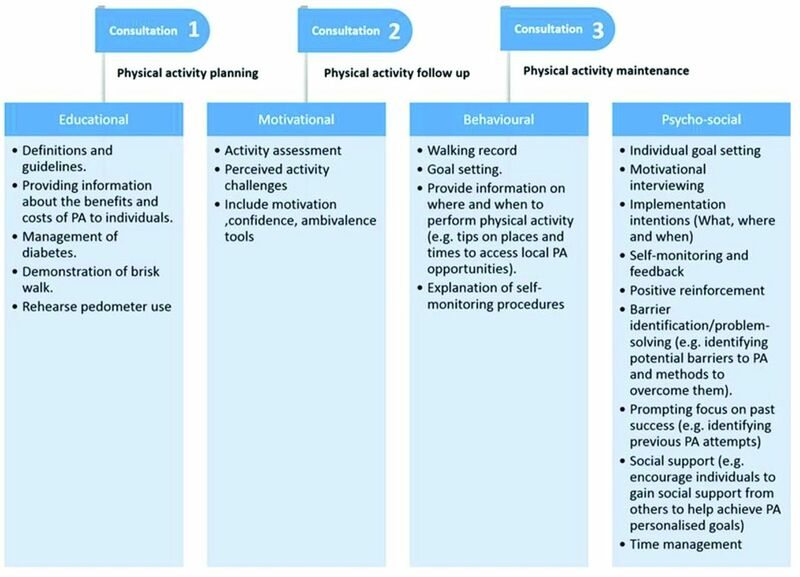 Global physical activity questionnaire (GPAQ) analysis guide: surveillance and population-based prevention, department of chronic diseases and health promotion. Geneva: World Health Organization, 2014.
. Oman world health survey: part 1 - methodology, sociodemographic profile and epidemiology of non-communicable diseases in oman. Oman Med J 2012;27:425–43. , 2013. Scot-PASQ Edinburgh, Scotland. Available from: www.paha.org.uk/Resource/scottish-physical-activity-screening-question-scot-pasq [Accessed 23 Mar 2018].
. 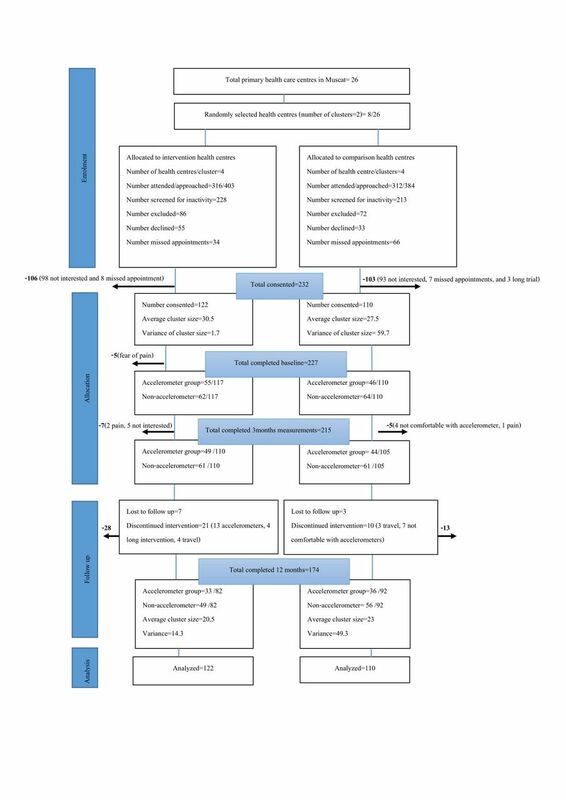 Unpublished work: Process evaluation of the “MOVEdiabetes” cluster randomized control study to increase physical activity in adults with type 2 diabetes in primary health care. Oman, 2018.
, 2018. Data analysis using epi infoTM7. Available from: https://www.studypool.com/discuss/177326/data-analysis-using-epi-infotm7-descriptive-analysis-1 [Accessed 25 May 2018].
. Providing the evidence PAL technologies Ltd. Available from: http://www.palt.com/ [Accessed 23 Jun 2017].
. Diabetes management guidelines In: centre E. edn. Oman: MOH, 2015. Contributors TSA is the principal investigator in charge of the project. Other authors have all been involved in designing the intervention and evaluation. TSA prepared the initial draft of the manuscript and all other authors have contributed. All authors have critically reviewed and approved the final version of the manuscript. Funding The Oman Ministry of Health funded this project as part of a PhD grant offered to the corresponding author. Additional funds were provided by The Research Council (TRC) in Oman. Ethics approval Omani Research and Ethical Review and Approve Committee in the Ministry of Health. Data sharing statement Data available on reasonable request and approval from the Oman Ministry of Health.